Jarrett Walker's personal notes on places, arts, plants, and the search for home. In the temperate rainforest of the Royal National Park south of Sydney, my California-trained eye grabs onto those round green things in the middle. 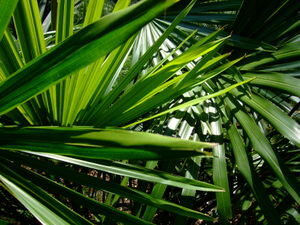 Native palms. California is famous for palms, especially L.A.'s ubiquitous telephone-pole Washingtonia robusta and the more graceful Victorian lines of the Canary Island date palm, Phoenix canariensis, common in the Bay Area. But the California palm is always an artifice. Installed full-sized by landscapers, usually in straight-line formations, the public urban palm of California lives only in a robust young-adulthood. It's rare to see them in the early stages of growth, nor are they often allowed to wither or die in public prominence. I had to come to Australia to experience young palms. 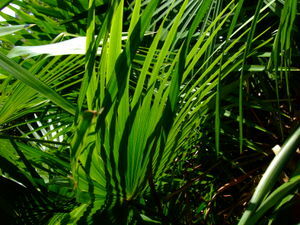 Palms aren't like trees, which grow both upward and outward over the years. Instead, the head of a palm grows to full size at ground level, and then rises on a simple round pole, like a hydraulic lift. The pole never gets wider; unlike trees, palms don't add annual rings. In gathered multitudes, all different heights but identical widths, growing palms can be suggestive of mushrooms, or even of urban skylines. 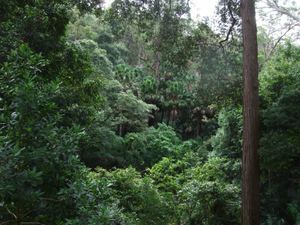 Around Sydney, the native palm is the Livistona australis, the southernmost, and presumably hardiest, of the Australian palms. I suppose I greet it with relief because there's only one species, so no problem of identification, quite the opposite of the maddening 800-fold eucalypts. 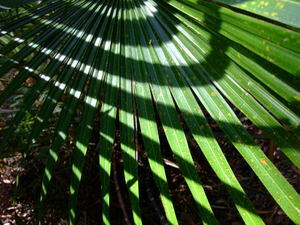 But I also enjoy its almost round fans, and the intriguing shadows that they cast on one another.